This article provides information about the Session Extension feature. 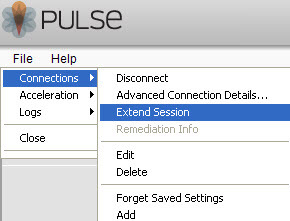 Session extension allows user to extend the existing session, prior to its expiration. It is useful in situations, in which the tasks (file transfer, and so on) require continuous network connectivity for a long time. 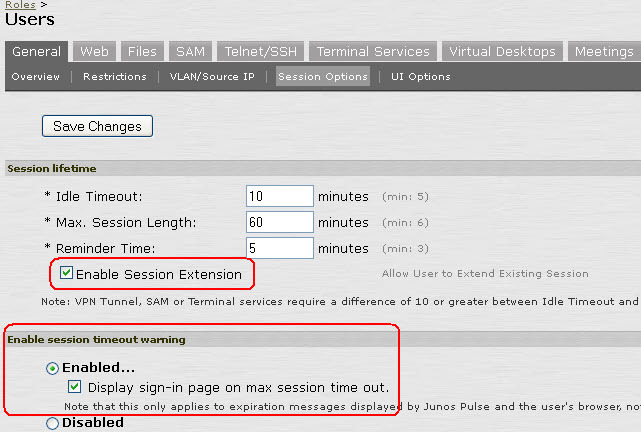 Users receive a warning dialog box, prior to the session expiration, prompting them to extend session or proactively extend the session. Maximum session length configured in SA is 60 minutes. User 1 is logged in at 4:00am. As per the Maximum session length, User 1’s session should expire at 5:00am. Around 4:50am, User 1 extended the session by clicking Extend Session. Now, the session gets extended till 5:50am (which is, 4:50am + 60min maximum session length = 5:50am). Info EAM30446 2012-03-16 04:50:39 - ive - [10.10.10.20] user1(Users)[Users] - Session extended for user1/Users from 00-0c-29-01-aa-ab.